Wagtail UK Ltd is an international, multi-award-winning company, specialising in detection dogs and dog handler training. Established in 2003, Wagtail provides detection dogs and related services for government agencies including UK Border Force, HM Revenue and Customs, Police, Trading Standards and Armed Forces. The company specialises in detection dogs for explosives, drugs, tobacco and products of animal origin including ivory, bush meat and pangolin scale, and prides itself on a philosophy to deliver quality without compromise. What will this role of Instructor / Detection Dog Trainer entail? Working from the detection dog handling school in North Wales, as an Instructor / Detection Dog Trainer, you will be part of a team of Instructors yet delivering courses independently. You will deliver a wide variety of pre-prepared structured courses to both private clients and company employees, which will be both hands on and classroom based. Courses delivered by Wagtail include but are not limited to; Passive / Proactive / Dual Purpose Dog Handler Drug Detection courses – Level 3, and an Explosive Detection Dog Handler course – Level 4. Tobacco and Live Body dog training is also undertaken by the highly-skilled Wagtail Instructors. What will I need to be considered for this Instructor / Detection Dog Trainer vacancy? Whilst not essential, a background within the military or police force is highly desired. You will be part of a well-established and growing business, where you will have the opportunity to attain further qualifications with a variety of classifications of dogs. Salary: £27,183, rising to £28,355 per annum following successful completion of six-month probation period. Please note, due to the nature of the business, there is a strict selection and vetting process involved in the hiring for this position. What will this role of Explosive Detection Dog Handler entail? Working as a specialist detection dog handler on various operational searches all over the United Kingdom for high profile clients. 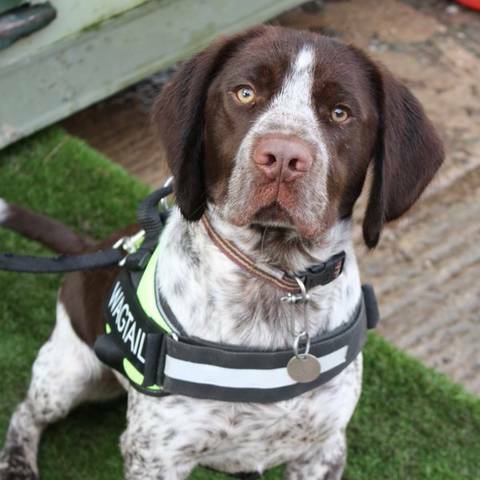 Due to a huge increase in demand for our sniffer dogs and detection services, Wagtail UK is looking for new canine recruits to join our highly successful team. If you are looking to re-home your dog, please contact: info@wagtailuk.com or joanne.martin@wagtailuk.com for more information.